The cold windy weather continues in Kalamazoo. Rebecca and Kewpee have had cold windy and often wet weather for the entire incubation period so far. 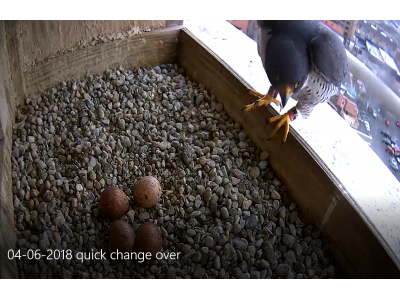 Views into the box almost always show a bird with feathers ruffling in the wind hunkered down over the eggs. When they swap places, it is a quick event and the eggs are back under wraps. Our neighbors to the north (Grand Rapids) and south (South Bend) are also incubating four eggs each. There is a video clip from 04-06 of Rebecca leaving and Kewpee arriving and a brief view of the four eggs.